1 lb. 5 lb. 40 lb. $8.49 to $169.99 & FREE Shipping on orders over $59 $35. 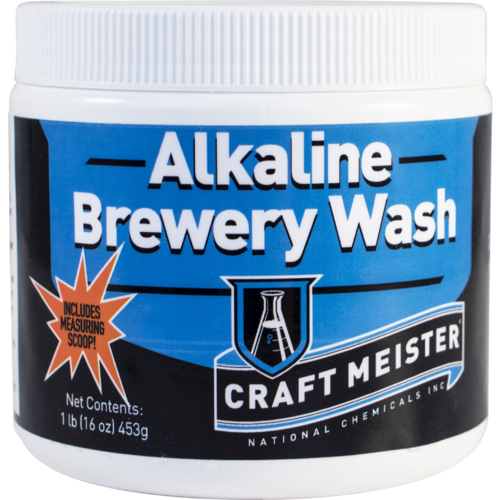 Craft Meister Alkaline Brewery Wash gets the results of professional caustic without burning your skin or hands. 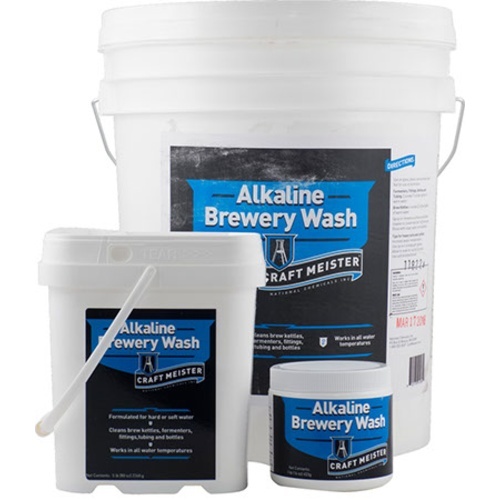 Dissolving rapidly in both hot and cold water, Alkaline Brewery Wash works quickly to break down heavy soils and removes even the most stubborn bottle labels. Great for an overnight soak, but not suggested for use on aluminum. The biggest difference between this and an Oxygen based cleaner, is the length of time the cleaner will work. With oxygen based cleaners, as soon as that active oxygen degrades, you are just soaking in dirty water again. The Alkaline however, will continue to work long after Oxygen based cleaners stop. If you normally leave a dirty carboy or keg overnight with PBW or OxiClean, the Alkaline Brewery Wash will do that job better. Because PBW is too expensive for not being about to reuse it. I ran out. I use it every other time when washing brewing equipment. Very good carboy and keg clearner, works well in cold water, better in hot water. Used sample provided by Spike, works great! Read that it works better than PBW in less than hot water. Thought I would try it out. Can't hit glass carboys with hot water without risk of glass stress. It works better than the other options since it contains caustic. Just don't use it on aluminum. Easy to use when I'm not wanting to clean aggressively at the end of the brew day. It's a great brewery cleaner! Works great, especially in cooler water. Great clearner for steel and plastic. Recommended by the Spikebrewing, the maker of my kettles. Can this be used on plastic carboys? BEST ANSWER: I’ve used it on my plastic better bottles and was fantastic. Really was a no scrub solution. I’ve since switched to a stainless fermenter and cannot attest to any issues with longevity. yes, it works just fine. Because it is "active" at lower temps than PBW, it is preferred. I use both cleaners in my brewery. Very expensive at the concentrations recommended. Be careful to ensure the powder is completely dissolved; I found a lump of this stuff at the bottom of my kettle after brewing - 70 minute boil! I hadn't realized that during cleanup after the previous batch, the cleaner had not completely been dissolved by recirculation. 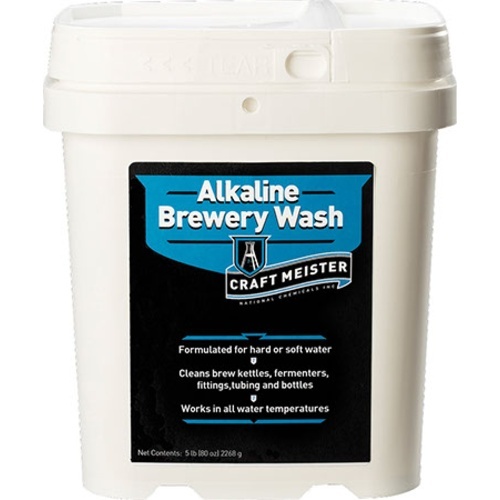 Craft Meister alkaline brewery wash is a great alternative to PBW, mainly because it is effective in cold water. I'd been using Oxyclean, but like the fact that this works faster, and rinses easier than either Oxyclean, or other homebrew cleaners. Works great. I use it to soak carboys, clean keys and kettles, and soak old bottles. Works well on everything. I like this stuff! Works well in all conditions, cold or hot water. The cleaner does a good job of removing grime without a bunch of elbow grease. It seems the amount required to do the job is excessive, making it expensive to use. Product is a bit more expensive than I like but it is a great pre-wash cleaner for those hard to clean kegs. I use this product to clean wine bottles. It has helped me to re-use wine bottles that I could not get clean before. I do soak them for about 6 hours in a bucket filled with hot water. I follow the directions for how much product to use per gallon. Then after the water cools down I use my bottle brush on them. The results are beyond words. This soaking also helps in the removal of labels. I have used PBW, it does not do as good of a job. I use this on glass and stainless steel. Left overnight, it will breakdown nearly anything. I'm not sure why the description says it will not burn your hands. Perhaps it won't "burn" them but it's definitely not comfortable. I highly recommend using rubber gloves when handling this. This stuff doesn't mess around. This cleaned spots in my glass carboys that PBW could never get rid of. Claims to work better with overnight soaks, which is what I do on all my equipment. Its a bit cheaper too which certainly isn't bad with as much as I use it. I've come to prefer this cleaner over PBW because this one dissolves more easily with less wait and less stirring, cleans just as well, and rinse water does not have to be hotter than the mixture to rinse well. I think it may also be less dusty because I used to sting the inside of my nose when dumping the PBW powder into the vessel to be cleaned, but that has not happened with ABW. I use it for soaking glassware like growlers, washing out plastics like fermentation buckets, and in the sump pump powered keg washer. It does not foam or otherwise cause me any trouble in any of those applications.